Obviously, I don’t know any more about who the mastermind is than anyone else. But based on the discussion in the comment section of my Daredevil #24 revisited post, I think I’m ready to call it. I know, I know. I said in the follow-up post to Daredevil #25 that the most recent issue didn’t make me any wiser as far as the big secret villain was concerned, but that was because I hadn’t done my homework yet. After I decided to explore that lead from last month in light of Daredevil #25, it seems pretty convincing. If you don’t want to know where I’m going with this (and I may be dead wrong), don’t continue reading past the image below. Mister Fear probably feels that he already got his revenge on Daredevil during Brubaker’s run and I can’t honestly think of a reason why various other characters of interest would be this angry at Matt. One of the reasons I’ve been suspicious of the Bullseye hypothesis (aside from his being even more dead than Death-Stalker), is that he’s really not a team player. He’s worked on orders from others, but he’s not the big master plan type. If he wanted Daredevil dead, he might play with him a little, but not go to these extremes. He doesn’t really have the attention span for it. Death-Stalker, on the other hand, has a history of hiring henchmen to do some of his dirty work. He has teamed up with the Gladiator and the Unholy Three (never a wise choice, if you ask me). More importantly, if the current mystery villain is in fact Death-Stalker, this wouldn’t even be the first time he “created” a super-human. 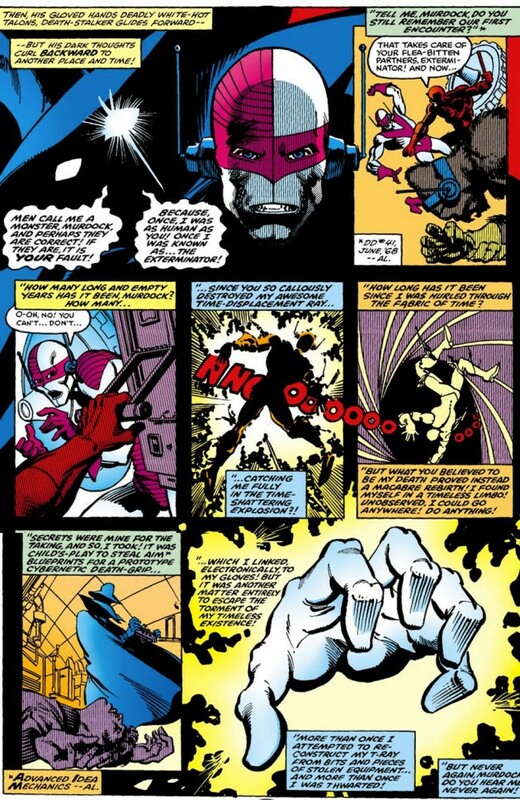 In Daredevil #138 (vol 1), by Marv Wolfman and John Byrne, Death-Stalker takes on the identity of Death’s Head and sends the suitably named Smasher to go after Daredevil. 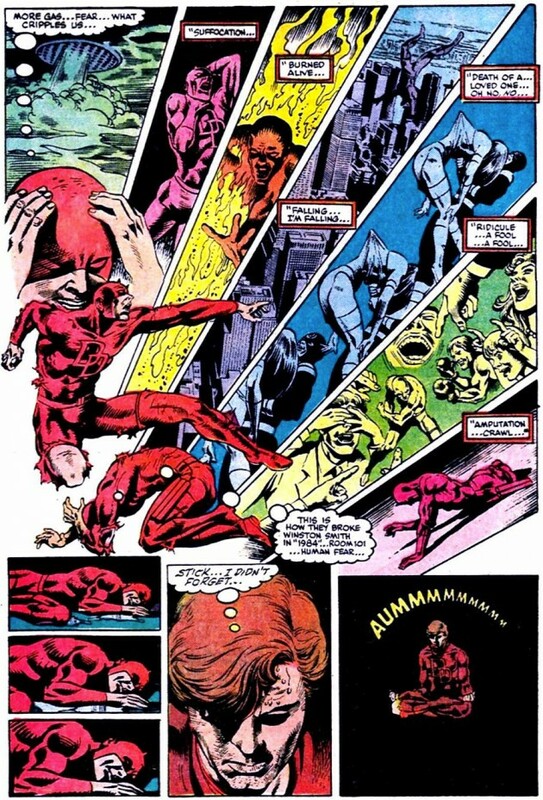 Another “Smasher” appears in Daredevil #149, by Jim Shooter and Klaus Janson (yeah, Death-Stalker killed the first one in Ghost Rider #20 which tied into Daredevil #138), talking about how the Death-Stalker gave him strength and that all he has to do to pay him back is kill Daredevil. Interestingly, this issue also contains a reference to rain messing with Daredevil’s radar sense. Daredevil #208 (vol 1), by Harlan Ellison and Arthur Byron Cover, with art by David Mazzucchelli, is a very entertaining issue. The story revolves around the Death-Stalker’s mother who has set up an intricate trap for Daredevil to be activated automatically after her death. The scope and insanity of this house of horrors suggest that the Death-Stalker himself wasn’t the first in the family to be more than a little nuts. And, if my working theory is correct, they both shared a flair for the ridiculously elaborate. Okay, so his mother blew up his childhood home and probably spent a great deal of the rest of the family estate on turning it into a deathtrap in order to avenge her son’s death. Still, the Sterling family likely had other assets and we can assume that Death-Stalker had some stashed away or invested in his own ventures prior to his apparent death. Whatever this mystery villain is up to, we can assume that he needed a lot of money to do it. 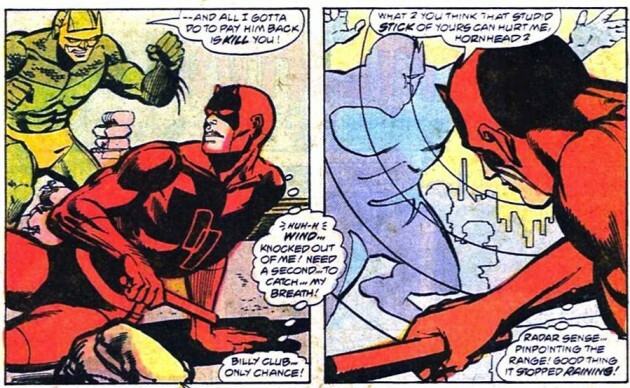 There are actually more things that stand out to me while re-reading Daredevil and Death-Stalker’s past encounters, but time won’t allow for me to recount them all. As Dan also pointed out, the Celtic cross pattern seen in Daredevil #24 might be highly significant. It was the type of tomb stone that Death-Stalker ended up in, but not before tying Matt Murdock himself to it, as seen below from Daredevil #158. Yep, I agree! I’ve already mentioned that I think it’s him in previous posts. But for it to really make me happy, I gotta see him back in his Death-Stalker garb, ready to take on DD. Have there been any hints as to him resurrecting himself as it were? Does his plan to destroy Matt also involve his coming back in some way? Maybe Spot or The Coyote had a bit to with that? Don’t know. Just throwing it out there. Another hint: also the Spot and the Coyote used some kind of teleportation system, which the Death Stalker also mastered. Interestingly, Death-Stalker also has a connection to Karen’s father after assuming Death’s Head’s identity during one of his outings. The guy sure does like dress-up. Oh man, here’s another thing. If it is Death Stalker with the time displacement ray then that goes right along with Marvel’s other hints. A lot of the upcoming comics include allusions to something involving time travel. All New X-Men, Uncanny Avengers has Kang, Spider-Man 2099 is coming back, even Waid’s Hulk has an upcoming time travel arc. Might be leading into Marvel’s next event series (after Infinity?). So it’s possible Death Stalker’s part of that too.